It's that time of year, again. Raspberries! Today was opening day of the raspberry picking season and the kiddos and I indulged in all the very berry goodness. We did this last year as well which I thoroughly documented here if you would like to go back and read all about the early stages of my fruit picking obsession. I'm sorry to report that my enthusiasm for u pick fruit has not waned one bit since last year. I will not bore you with the gratuitous berry shots this time around. I promise. 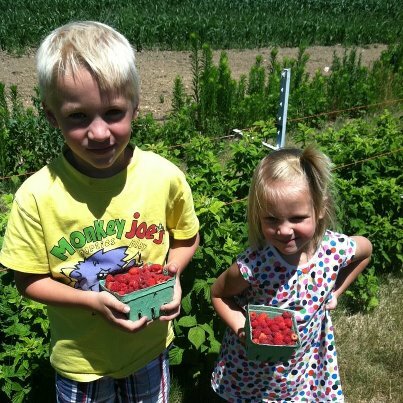 Mr. Man stopped picking for a second and said all thoughtfully, "Mom, this is our summer tradition; picking raspberries." I love that he's cheesy like me and understands traditions and savoring moments even though he's only six (okay fine-in less than a month he'll be seven but I have not entered the acceptance phase of that one yet so let's not talk about it). In my head and didn't want to ruin the moment and the way I was living one of my most favorite books from childhood ever. (Hmmm....I think we've just uncovered the dark hidden link to my berry picking obsession!). Hopefully it goes without saying but if you have not read this book you must immediately crawl out from under the proverbial rock you've been living under and get yourself a copy. Thank you. Anyway, I was here to post a recipe or something...ahh, yes! Raspberry Scones! I found this super easy raspberry scone recipe on Pinterest last night and whipped them up as soon as we got back from the farm. I'm assuming this was, in fact, a super easy scone recipe cause that's what the recipe says but I've actually never made scones before so I have nothing to compare it to. Considering though that these turned out to be the yummiest scones ever if I do say so myself I'm guessing it was really an easy recipe. I always assumed scone making involved lots of toiling and rendering of one's garments. But these were a snap. If only I'd known earlier! The recipe is from Martha Stewart's website (as any self respecting scone recipe probably should be...scones just seem so, well, so Martha don't they?). 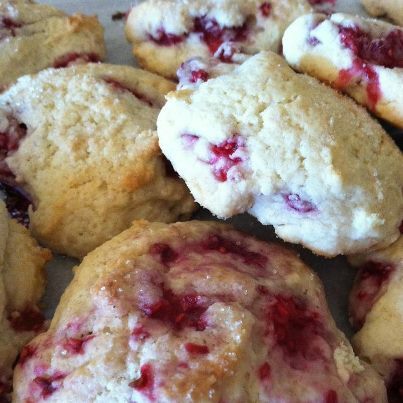 Here's a link to Martha's Fast Raspberry Scones recipe. And here's my finished product! They're really, really good. How jealous are you right now that I'm about to dive into one of these bad boys? (I just snarfed one down and the answer is you should be very jealous in case you're wondering). 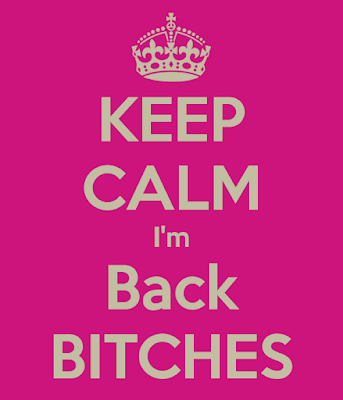 Finally, I'm leaving you with a link up to an awesome blog I stumbled upon today, Still Being Molly. Molly is hosting a #YOLOMONDAY link up and for me "only living once" obviously equals gorging yourself on fresh berries. Check out her blog and a bunch of the other YOLO Monday link ups...fun! I love comments! What's on your mind? Blog Design By Kristen Danielle Designs. Simple theme. Powered by Blogger.